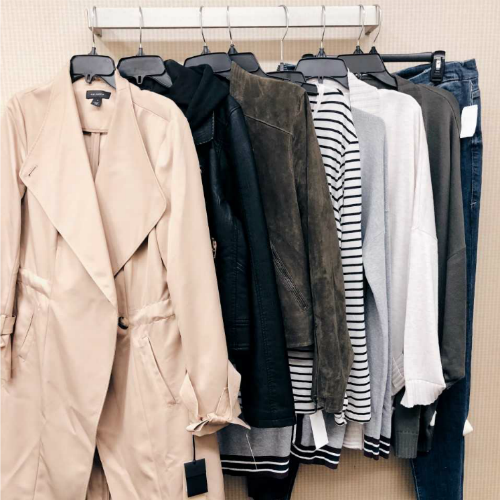 The Nordstrom Anniversary Sale is one of the most exciting shopping events of the year — you can score some incredible clothes at amazing prices. It’s also a great time to invest in key, versatile pieces like jackets, coats and premium denim. I had a big try-on sesh last week that you can check out here, but many of you have mentioned you struggle most with putting together outfits. So I worked on creating five head-to-toe looks using on-sale items. This trench is life! And the tie sleeves! French tuck the tee, throw your hair up in a high pony, lightweight statement earrings and a pop of edge with leopard boots and call her done for work or play. I picked up this super flattering suede jacket in olive (already have a red from last year) and paired with some skinnies, a floral or solid cami and some studded booties, you’re sophisticated and styled. These booties are my very fave from the sale, by the way… got them in both black and white. My favorite jacket of the sale! Removable hoodie, notch collar, zip details and only $65! Pair it with a softer, lacey top, jeans, booties with gold hardware, some small edgy earrings and a leopard crossbody bag… how perfect is this for happy hour or date night?! Given all the messages I received, you all loved this varsity cardi as much as I do. Pair it with a silky tank, skinnies, some easy loafers and a tote like this one with the cool zip details. I am in love with this entire outfit including the leather moto jacket and the military boots with a hint of leopard. Again, I love these tees oversized and comfy, french tucked in the front. I love this post! Lots of great outfit ideas. I like your style.